Renew your physical body, mind, and energy field as crystalline frequencies wash over you. Let go into waves of sound intended to soothe you and move your entire system through stages of release, expansion, activation, and integration. Sound Healing is one of the oldest forms of healing known to man and offers a drug free way to treat pain and illness and tune ourselves to the Divine. The therapeutic application of sound frequencies influence both the body and mind, helping us to return to a state of harmony and health. Scott Adam will offer a solo journey into sound. Bringing many aspects of vibrations for healing. 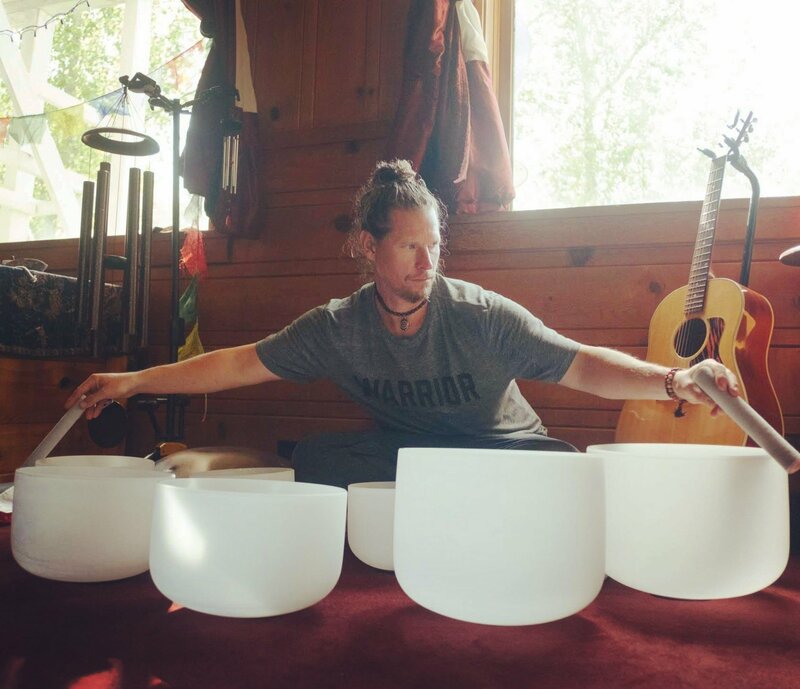 Through crystal bowls, guitar, hand pan, chimes and vocalizations Scott will create a landscape of sound for the soul to play and heal. Crystal singing bowls have the power and potential of both the quartz crystal with which they are made and the sound that they emit. The physical body is made up of various crystalline substances. The bones are made from a combination of collagen, which is a protein in the form of a double helix intertwined around it that forms the framework for a type of calcium phosphate crystal called “Apatite”. Apatite crystals exist throughout the body, in the skull and in our teeth.The crystal that is in our physical body, resonate with the crystal singing bowls sounds, which travels effectively in the water, which makes up more than 70% of our body, means that crystal bowls have the capacity to alter the structure of our being. These bowls re-align those parts of us that are imbalanced with the use of sound combined with crystal. This creates a vibration that will amplify and transform the healing energies, which are stored within the bowl, and work directly with the crystalline structure of the body as well as alter brain wave frequencies, allowing us to enter into the alpha-theta optimum healing frequency and also creating a balance and synchronisation in the two hemispheres of the brain. Generally people have one hemisphere that doesn’t fire properly, and this is true in Autism as well. As the bowls are made of quartz crystal and the physical vehicle strongly resonates with the energy of quartz, then the crystalline and cellular structure and makeup of the human body, which is combined with the sound vibration, enables the energy to echo throughout the body’s cavities, thus creating an extremely dynamic level of harmonic response. Please care for yourself well before coming and bring water to integrate the sounds you’ll be experiencing throughout the session. Wear comfortable clothing and bring a pillow or blanket if you wish to lie down. $20 to $30 suggested donation. To reserve your spot PayPal ScottAdam@icloud.com with innerpath4/5 in the memo line. I was born in New Jersey but have traveled the world following my dreams. I have been an actor in NYC, an EMT, Professional Athlete, Professional Snowboard Coach and Music Productions Manager. Since Wanderlust hired me as quarter master for their world wide yoga and music festival team in 2013, I have never looked back. The yoga path has guided my life since 1994 starting with Bill Atkins in NYC at the American Academy of Dramatic arts. Since meeting and studying with world known yoga teachers such as Sean Corn, Rod Stryker, Eion Finn, Janet Stone and MC Yogi, my life has transformed. After studying with Shealah Morris in 2015 and earning my 200HR YTT, I have been teaching yoga in Lake Tahoe, SF Bay Area, Santa Cruz and Nevada County. In addition to yoga Sound Healing came into my path and has become a passion. 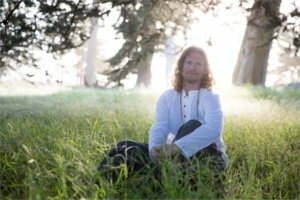 I started playing my Sun Pan in 2016 and began sharing sound healing along with my yoga offerings. I believe in the power of hatha yoga and healing vibrations as a means to shift collective consciousness. I also mentor at risk youth through Gateway Mountain Center’s Healing Hearts Program. I support youth who need extra care by giving them nourishing experiencing in nature and empowering them with the teachings of the yogic path. It’s an honor to serve each person who comes across my path. I look forward to meeting you and giving you a huge hug!